Click the photo to see where the video below was recorded. The Spanish Heavyweight Climbing Team, consisting of me and Linder, another 90 kg Swede living in Spain, decided on a date in Riglos. 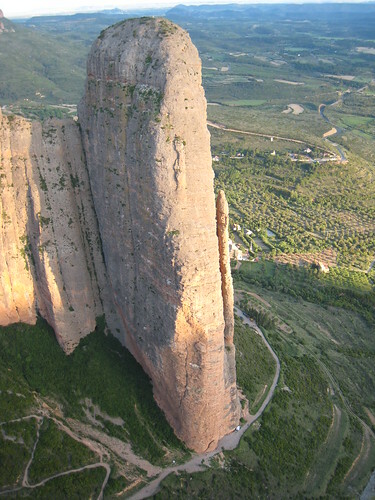 Having previously climbed together in Margalef and Montserrat the goal was now to find a good mix of the two: 300 meter long, steep and bolted routes. Friday night was spent scouting the cliffs a little. Being in the middle of May and the spring season coming to an end our choices where a bit limited. Most of the high quality routes are facing south and although we saw people on the main wall there was no way that we would spend a number of hours frying up there. Instead we found Directa as cimas. 280 meter long, four stars, 9 rope pitches, and the almost poetic grade of “6c/7a or 6b/A0”. Most important: The route is east-facing. Linder follows and takes over. He needs to apply a little A0 to make it up the final bulge of his lead but I manage to free it on top rope. We have been slow and it’s time to speed up a little not to have to spend the night on top of the peak. Next up is the crux of the route, the pitch that has give it the grade of 7a, and I don’t even bother trying to free it but go straight to A0. It’s still quite a challenge, meandering back and forth. From what I remember this was the most un-interesting pitch of the climb. Following is a long 6a that a tired Linder climbs/aids and brings me to the last, easy pitch of the climb. Trying to avoid knocking down one of the last loose rocks I finally find the anchors and start bringing Linder up. It’s quarter to nine and the sun is setting. A quick photo fron the top and then we head for the rapell on the back side, scramble down to the second rappel and then down climb to the trail that takes us back to the start of the route. In complete darkness we stagger down into the pretty little village and head straight to the refugio, the little climbing hostel, where we get to order a really good meal including wine for about 10 € or so. We toast and finally relax after one of the strangest and coolest long routes any of us have done. Two climbers can be seen on this photo. Click to see where they are. The plan was to climb an easy and short route the day after. Well… Let’s just say that 200 meter of overhanging climbing was quite a lot and that we where completely dead the following day. Climbing in Riglos require a lot, if you climb to slow the hanging belays are horrible. Choose a route a couple of grades below your maximum level and you’re sure to enjoy a full day of jug hauling up these crazy conglomerate walls. I’m so much looking forward to heading back to Riglos this winter, it’s time to taste the main wall! 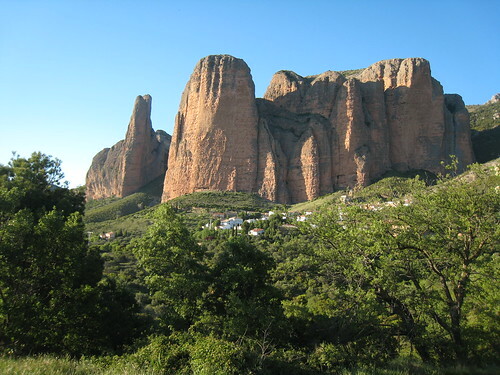 Tagged with Aragón, article, multi-pitch, riglos.